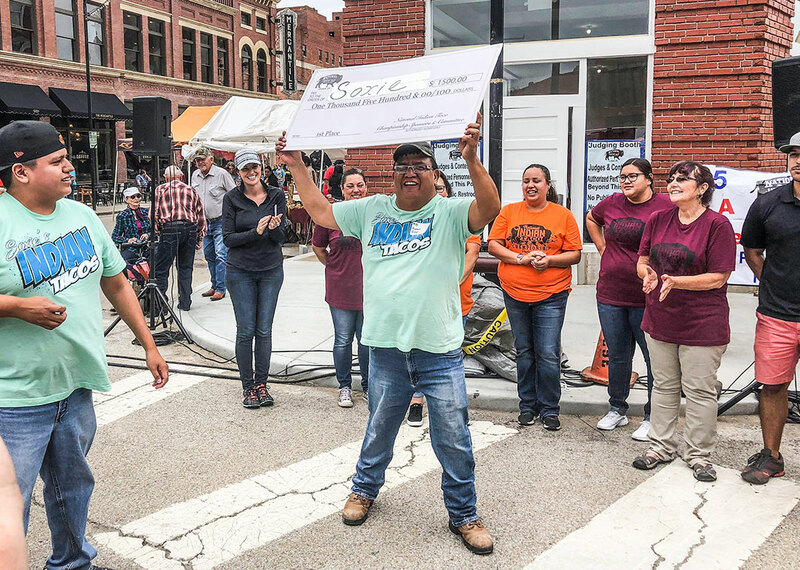 Thunderstorms and rain were the forecasts for Oct. 6 in Pawhuska, but as the morning came and went, the rains stayed away, and patrons enjoyed this year’s National Indian Taco Championships. Francis Soxie (Pawnee) took first place with a $1,500 prize. Team Strikeaxe took second place with a $1,000 prize and Frybread Factory won third place for a prize of $500. The People’s Choice Award also went to team Strikeaxe, who took home an additional $1,000 for their efforts. Soxie and his team live in Glencoe but he is from Pawnee, he said. His wife is Cheyenne Arapaho and together they cook and have Indian Taco sales around their area and are also asked to cook for events. This is the third year they’ve entered the NITC and in 2016 they were the runners-up. When asked what their secret is he said, “Ummm, I can’t go that route,” he said with a laugh. “It’s all fun, it’s just what we like to do.” He said they made about 150 Indian tacos for the competition and used about 100 pounds of flour for their frybread. “We’ve been practicing and practicing and playing around with it. I’ve always wanted to do this. I’ve watched a lot of our women folks, mainly back to my grandma, back to my mother-in-law, my sister-in-law and my aunts, all my aunts in my family are good cooks,” he said. Now in its 14th year, the annual NITC is held in downtown Pawhuska on Kihekah Ave., north of the Triangle Building. The day brought food and vendor booths, lined up on both sides of Kihekah, filling up a city block. Judges reported to a building where they were presented unidentified Indian taco plates from each of the competing booths. The judges sampled each dish and entered scores for each plate that were used to tabulate and determine the top three finishers. This is the third time team Strikeaxe has won People’s Choice. The team is made up of Osages Marjorie and Junior Williams, Thomas and Anna Trumbly and assisting family members. They also placed third last year and placed second in 2014, respectively. The People’s Choice Award is determined by attendees who pay and sign up to be judges and those judges (with issued badges) are eligible to buy discounted samples of the Indian Taco plates and afterward the judges are given five tickets that are used to insert into the booth contestants’ containers of their choice, according to the contest rules. The booth contestant who receives the most tickets is the winner. The Pawhuska Chamber of Commerce hosts the competition with sponsors including the Osage Nation and Osage Casino. A contest powwow also took place with dancers competing for first, second or third in their respective categories. The NITC committee, made up of Pawhuska Chamber of Commerce employees and community volunteers, begins planning the event in May and meets consecutively until October, said Joni Nash, PCC director. She said it requires a lot of hours to plan and work the event, but it’s worth it. 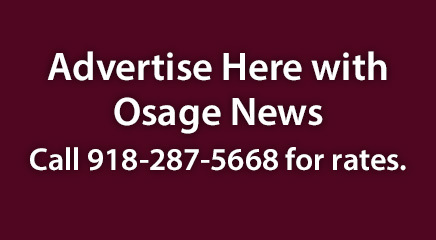 A complete list of Powwow Winners will be published in the November edition of the Osage News.